On Tuesday, The Wall Street Journal ran an opinion editorial by Jay Greene, “The Imaginary Teacher Shortage,” which posited that while the United States has added a million teachers to the rolls since 1970, student performance has remained unchanged. Greene challenged the presidential candidates’ plans to add more teachers, imploring state and local officials to instead shrink the teaching force. Mr. Greene proceeded to make an argument based around exactly the kind of flawed, simplistic logic that is so damning to contemporary “reform” efforts. Scapegoating teachers for being unsuccessful and overpaid is not only lazy critique, it is irresponsible. Finger-pointing draws energy and attention away from the far more nuanced dysfunctions of the education system, but furthermore, reveals a shallow and narrow interpretation of educational progress during the past 40 years. This article is link-bait, at best, and I am disappointed by the lack of integrity of The Journal for running a piece based on such tired logic and misplaced criticism with grossly misrepresented statistics. The editorial features an image of a smiling young teacher with pin curls from some idyllic day of yore. 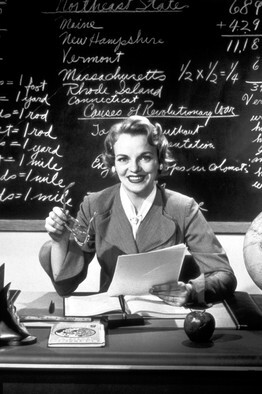 She sits at a sturdy wooden desk with an apple atop, with a stack of papers in one hand and reading glasses in the other, in front of a blackboard with white chalky cursive. (A closer look at the blackboard suggests that on the day of the photo shoot, students were memorizing metric conversations and causes of the Revolutionary War, while also learning to multiply fractions and add with decimals. Must have been a busy day!) The caption states: “How did she do it? Less money for education, larger classes—and plenty of success.” Mr. Greene, kudos to you for undermining so many basic facts of American history, economics, education, technology, politics, and data in one cheeky caption. How did she do it? Less money for education, larger classes—and plenty of success. Come on, teachers! We took 7.1 kids out of your classrooms – why haven’t the test scores budged? Firstly, I’m curious to know by which metrics of achievement Mr. Greene is measuring student stagnation. To date, our best measure of national student achievement is the National Assessment for Education Progress (NAEP), which did not begin testing in reading and math until 1983, at which time, special needs students wereexempt from testing. The other standard indicators of national student achievement at this time were the SAT and ACT, whose scores only represented the averages of college-bound seniors, not the entire student population. Metrics aside, Mr. Greene’s statement that the United States has “nothing to show for it” is patently false in that it not only assumes that all other factors have remained consistent in the classroom (including the very purpose of schooling), but also completely fails to acknowledge educational progress by any measures other than test scores and class size, (which are nearly useless in aggregate, anyway). In 1970, just 12.5 percent of 3 and 4 year olds were in pre-school. Research has consistently shown the importance of pre-school in terms of later academic success. 40 years ago, pre-school education was reserved primarily for children of affluence, which disproportionately put low-income children at an academic disadvantage at the ripe age of 3, which partially explains the socio-economic achievement gap from very young ages. Thanks to federal and state funding for programs like Head Start, nearly half of 3 and 4 year olds receive a pre-school education today. We still have a long way to go towards ensuring early child hood education for every child, but the United States has quadrupled the percentage of 3 and 4 year olds receiving early childhood education during the past 40 years. What about the other end of the education pipeline? In 1970, just 6.7 percent of males and 3.8 percent of females over the age of 25 completed four years of college and the median number of years of school completed was 12 – the equivalent of a high school degree. Between 2007-2009, 38.8 percent of 25-34 year olds had completed an associate’s degree or higher. What do these numbers mean for the K-12 teaching force? Comparing teachers in 1970 to teachers in 2012 is futile, because the nature and purpose of schooling has transformed so fundamentally during the past 40 years that the modern demands of the profession bear little resemblance to job description of teachers in 1970. Unfortunately for teachers in 2012, the United States now pays attention to educating every child, not just the healthy rich white kids, (which is a real bummer because teachers were so successful with those students). If the goal of schooling is to prepare young people for careers and citizenship, then the turn of the 21st century has necessitated the most dynamic shift of educational outcomes in American history. Globalization and the digital age have had an unprecedented impact on our workforce economy. The number of manufacturing jobs in the United States during the 1970s exceeded the job numbers from the World War II era manufacturing boom. Those jobs remained at fairly steady levels until 2000, at which point they began to steadily and rapidly decline. In 1970, the majority of the student population was preparing to enter the manufacturing workforce, which required basic reading and math skills, but almost no high level critical thinking skills. Digital literacy was hardly a concern, since computers were still the stuff of science fiction for the average Joe. So, in 1970, it was wholly acceptable for less than 10 percent of students to be on the college track. Fast forward 40 years and politicians proclaim: everybody should go to college! No longer do we consider teachers a success for preparing 10 percent of students for higher education. Today, teachers are expected to have 100 percent of students on the road to college (never mind that it defies the law of averages and basic principles of economics). I will be there first to admit that there are worthy parallels between business and education in terms of motivation, culture, financing, and leadership. However, let’s stop short of commoditizing children, please. We are not making iPods (if we were, that manufacturing jobs graph might not look so dire), we are educating human beings, who have a helluva lot more moving parts. Technology offers some wonderful innovations for education, but education technology should be designed to assist teachers, not replace them. I would like to see a computer break up a fight or mediate a conflict between angry adolescents. 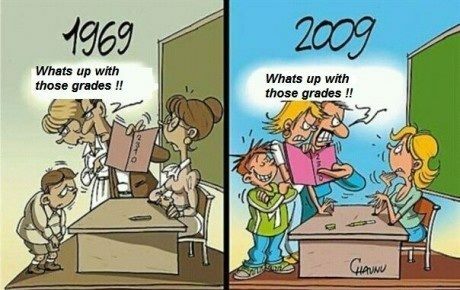 I would like to see an iPad dry a child’s tears or help him blow his nose or zip her jacket when it snags. I would like to see a SmartBoard smile or tie a tiny pair of shoes. Educators get a lot of flack for being too warm and fuzzy, but the fact of the matter is that teachers are working with little humans who sometimes need a little warm and fuzzy in their strange and scary lives. Education technology products like Common Curriculum and Class Dojo are wonderful in taking the nuisance out of teaching tasks like lesson planning and classroom management without undermining the role of the teacher. The flipped classroom model certainly has some benefits for some students in some classrooms. But before we go and replace all our teachers with Sal Khan, please remember a little something called the digital divide: not every student has the luxury of going home to watch Internet videos. In fact, only 78 percent of Americans have Internet access. I wonder if the 20 percent of children living in poverty in America fall into the 23 percent of people without Internet access? That sure would be a snafu for teachers trying to flip classrooms in areas of highly-concentrated poverty. This sounds good in theory: recruit the best people and compensate them accordingly. It does not work. Teach for America has done a fine job of recruiting the top college-grads in the country by igniting their sense of injustice and passion for change. We do not have a recruitment problem in teaching – we have a retention problem. Nearly half of all teachers leave during their first five years because they are burned out, which is a problem that salary increases (while nice) will not fix. I have informally surveyed many teachers over the past several years and asked them: “Would you rather have a $50,000 raise or another co-teacher or aid in your classroom?” No one has taken the money. On this point, I actually agree with Mr. Greene. One of every five children in America lives in poverty. Children living in poverty are disproportionately facing the added challenges of poor nutrition, incarcerated parents or siblings, single family homes, drug use, physical or sexual abuse, gang culture and neighborhood violence. These challenges are not insurmountable, but we are kidding ourselves and doing a disservice to students to continue ignoring the overwhelming evidence that these factors affect classroom performance. As a nation, if we decide that schools should be the place to address all societal ills, we owe it to the students and faculty of our schools to provide them with the necessary resources. School equity means giving students what they need to succeed, not treating all students the same. Some students may thrive in a classroom of 30, while others need a small group setting limited to five students, and still others will need one on one attention. Some students may naturally develop socio-emotional skills in a 20 minute recess, while others will need years of counseling to overcome Post-Traumatic Stress Disorder or other mental health issues. Simply adding more bodies to the classroom will not improve student achievement nor will it increase teacher satisfaction. If we want our teachers and students to be successful, we must provide them adequate capital to provide resources at their discretion. Students will only be successful when we stop blaming teachers and start acknowledging that the true obstacles to education lie far beyond the classroom doors.